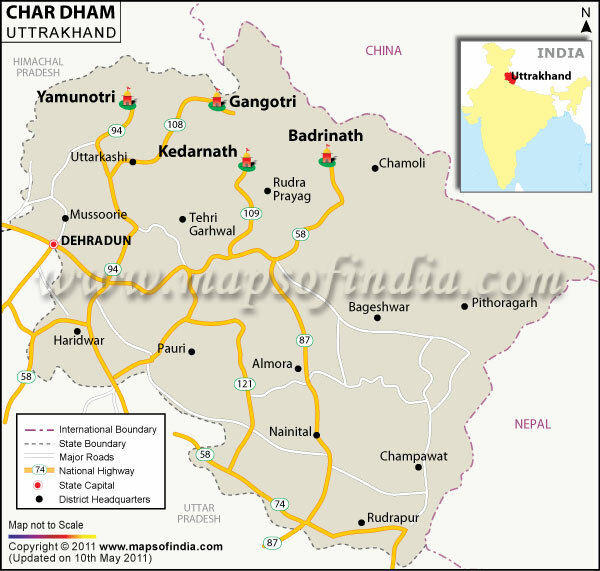 Static Part: About Char Dham project and its geographical location. Dynamic and Current: Significance of the project, environmental concerns, NGT and Supreme Court’s views. Context: Government’s ambitious plan to connect the Char Dham pilgrimage spots in Uttarakhand by all-weather highways was put under a question mark. The Supreme Court (SC) has sought the Centre’s response on why it should not stay the National Green Tribunal’s (NGT) clearance to the project. The proposed four-lane expressway to Gangotri, Yamunotri, Kedarnath and Bardinath in the hill state has been among the flagship projects of the Ministry of Road Transport and Highways. But the idea of the 900-kilometre road network in the sensitive mountains of Uttarakhand drew scepticism from environmental activists who fear the highways and the tourists they would bring in will be at the cost of the ecological balance. The roads will be widened from 12m to 24m and the project will involve construction of tunnels, bypasses, bridges, subways and viaducts.